With just a few simple ingredients added to a basic yellow cake mix, this all-vegan and dairy-free pineapple-upside down "dump" cake is ready to pop into the oven in just two minutes. Its called a "dump" cake because that's what you do! No mixing needed, just dump the ingredients right into the cake pan! If you're vegan, be sure to use a vegan cake mix, such as Duncan Hines. This pineapple dump cake recipe is incredibly popular, even with people who aren't vegan, since it really is an "accidentally vegan" recipe. Cake mix recipes which turn a store-bought boxed cake mix into something a little bit more special and "semi-homemade" are very popular. If you're looking for more ideas to transform a normal box of cake mix, then you will definitely want to try making easy vegan cake mix cookies, or these pumpkin and chocolate cookies, made with spice cake mix, pumpkin, and chocolate chips, for a real treat. Or, for another dump cake which you can make right in your crock pot, try a crock-pot cherry pie dump cake. Lightly grease a single layer cake pan. You can use either a round or a square pan. Pre-heat the oven to the temperature indicated on the box of your cake mix. 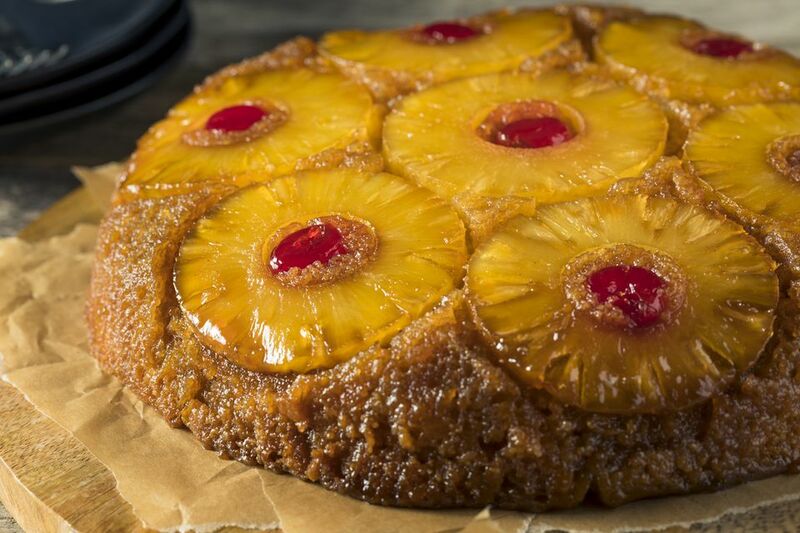 Dump the undrained crushed pineapple into your lightly greased cake pan and spread into a roughly even single layer. Then, dump the pie filling on top of the crushed pineapple and again, spread into a roughly even single layer. Cover the pie filling and pineapple with the powdered cake mix right out of the box, then drizzle or crumble the vegan margarine on top of the cake mix. If you'd like, you can also sprinkle the top with some nuts and brown sugar (both are optional). Bake your pineapple dump cake according to the directions on the box of cake mix, and voila! You're done! Now, wasn't that easy? Enjoy your two-minute pineapple upside-down dump cake—no frosting needed!